Arrive at Trivanadrum airport and meeting and assistance upon arrival and transfer to kovalam for check-in at the hotel. Although in recent years Kovalam has had an influx of tourists, it still retains much of its original charm being made up of a series of sandy bays and rocky promontories. The day is free for you to explore this area at leisure. You may decide to walk along the sandy beaches or wander round Kovalam village. In the evening you can sit in a beachside cafe, enjoying the vista of local fishermen sailing out for their evening catch with a back-drop of a setting sun. Kerala is particularly renowned for its herbal care, and you may choose to try out an ayurvedic massage. Overnight at the hotel. This morning you will drive to Alumkadavu, situated just north of Kollam. Here we will board our houseboats and begin our journey into the network of the Kerala backwaters, travelling north via Kanyankulam Lake to Thottappally. The traditional houseboats are simple vessels, with en-suite twin rooms. The pace is relaxed – enabling us to see riverside village life in its entirety. The industrious villagers survive on narrow spits of land, keeping cows, chickens and cultivating vegetable gardens. Even the shells from the fresh water mussels are burnt to make building lime, and the fibre from the coconut palm has many uses including coir products made from coconut fibre. The gardens are generally well tended often with brightly coloured flowers, such as hibiscus, contrasting sharply with the tropical greenery. Lunch & Dinner on houseboat. 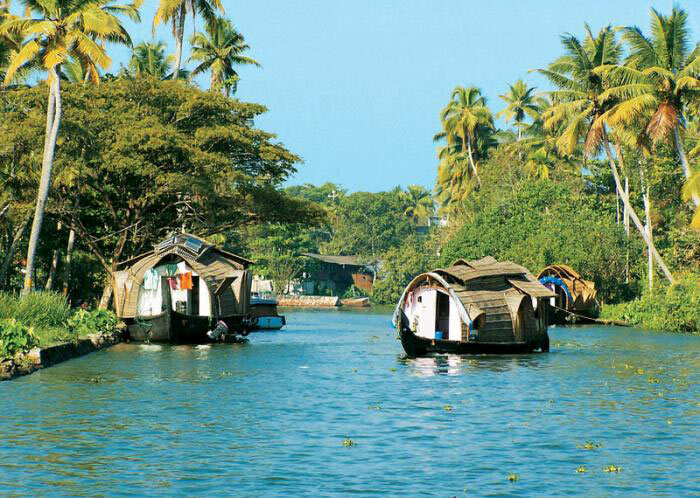 We continue our trip along the palm-fringed waterways to Thrikunnapuzha. Our accommodation is superbly situated on its own beautiful island within this stunning lagoon. The afternoon is left free to explore at your leisure. You may choose to walk to the nearby villages or along the golden beaches. Alternatively, you could hire a bike to explore the local area or take a rickshaw to visit the Snake Temple at Manarasala. In the evening, we have the opportunity to try some of the tasty food, typical to this area. Lunch & Dinner at the hotel. We continue travelling through the backwaters this morning but exchange our houseboat for a motorlaunch, one of the many types of craft to be seen here. The style of boats varies immensely depending on the area of backwater. On the more open canals, you can see boats with large sails – the bow often carved in the shape of a dragon. The boats are the lifeline for the villages, acting as taxis, mail deliverers – even the harvest is carried in boats. You may see great pyramids of coconuts or even spot the odd buffalo being carried by boat and days gone by these waterways were once the scene of postharvest water wars, which have now evolved into great water pageants. Boat race crews will often live together and visit a shrine to make their peace with the Almighty. Interestingly, all women teams compete in their own boats. Tonight you will stay with local families within a village to experience local customs and traditions. Lunch & Dinner at the hotel/ guesthouse of local village. Today we leave the tropical backwaters and head inland to Periyar situated close to the border with Tamil Nadu. 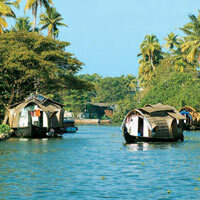 Kerala was first visited by King Solomon and over the centuries it has been noticeably influenced by overseas traders. This unique balance of people from different religious backgrounds (Hindus, Christians and Muslims) living together, is unseen in other parts of India. We shall see much evidence of this when we pass pastel coloured churches and shrines. Our route to the Periyar wildlife sanctuary takes us past many rubber plantations, and through the varied spice gardens of this part of India. We include a visit to a spice garden at the edge of Periyar. This afternoon is left free for individual activities and relaxation. Overnight at the hotel. Periyar is one of 16 tiger reserves in India, although it is probably better known for its elephants. This morning we go for a walk in search of wildlife animals such as the wild boar, giant malabar, porcupine and the flying squirrel. The Park itself is made up of a variety of habitats, open grasslands, deciduous, semi-evergreen and tropical forests all of which have different animal species. The ecosystem of the tropical evergreen jungle is very interesting as the trees grow up to 40m, and the dense canopy only allows in limited sunlight. Therefore at ground level, there are abundant ferns, orchid and air plants- plants which need little light to survive. Afternoon you may do an optional cookery course and learn how to cook some traditional Indian food. Overnight at the hotel. Today morning we will drive to Munnar through an area of many spice and tea plantations. Kerala has been renowned for its spices for at least 2000 years, the coast had been known by the Phoenicians, Romans, Arabs and Chinese for its sandalwood and spices. Munnar is a pleasant place to spend time, with its green tropical forests, fresh mountain air and neat tea plantations. We stop to visit a tea plantation where we can see the leaves being picked and learn how it is processed. It is the women who usually pick the tea because of their nimble fingers. Their brightly coloured clothes contrast sharply with the greenery of the plantations. Overnight at the hotel. Today we make our way back to the coast and drive on to Cochin. This place has been a gathering place of merchants since antiquity and is full of bustling traders. Upon arrival check-in at the hotel. We will have the afternoon free for relaxation & shopping. Overnight at the hotel. Morning city tour including visit to Fort Cochin, Jew Town synahogue, the Chinese fishing nets and St Francis Church, which dates back to 1503. Continue to The Mattancherry Palace, a gift from the Portuguese to the raja of Cochin in 1515. Later this afternoon, visit the Kathakali dance studio where you will have access to the artist’s dressing room and a short demo on the elaborate make-up that this dance form is renowned for. The dances usually portray events from the Ramayana and Mahabharata, great Indian epics. This evening there is the opportunity to see these dancers. Overnight at the hotel. Today we board an early morning train to Trivandrum and then drive onto Kovalam. Upon arrival check-in at the hotel. We will have the afternoon free for relaxation, shopping, a South Indian cookery class (optional). Overnight at the hotel. In time transfer to Trivandrum airport to connect flight for onward destination.